Dalkey Archive Press, 9781564781819, 240pp. 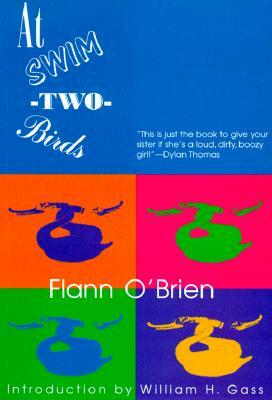 A wildly comic send-up of Irish literature and culture, "At Swim-Two-Birds" is the story of a young, lazy, and frequently drunk Irish college student who lives with his curmudgeonly uncle in Dublin. When not in bed (where he seems to spend most of his time) or reading he is composing a mischief-filled novel about Dermot Trellis, a second-rate author whose characters ultimately rebel against him and seek vengeance. From drugging him as he sleeps to dropping the ceiling on his head, these figures of Irish myth make Trellis pay dearly for his bad writing. Hilariously funny and inventive, "At Swim-Two-Birds" has influenced generations of writers, opening up new possibilities for what can be done in fiction. It is a true masterpiece of Irish literature.